An iridescent streak of orange across a green field. An artist creating angles and spaces that nobody else could imagine. If the imperious Beckenbauer reinforced the German stereotype, and if Maradona always showed his street urchin roots, Johan Cruyff created our idea of Holland as being a freewheeling, liberal place where everything is up for discussion and argument. 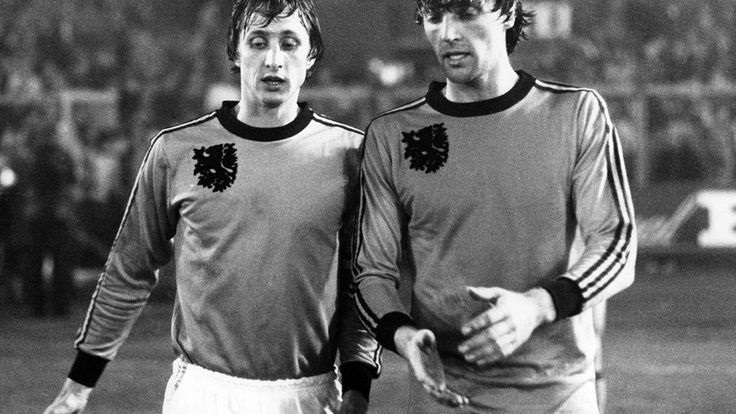 Discuss and argue was what Cruyff did, when he wasn’t on a football field pointing and directing his ‘cavalry charge of surgeons’ as Hugh McIlvanney called the Dutch ‘Total Football’ team of 1974, still the best team not to win a World Cup. That Cruyff and Holland still celebrated when they lost the final to West Germany, and that Cruyff said he was happy to be remembered for the beautiful football they played, only added to the impossible romanticism and mystique of the player and the team, at a time when winning hard and ugly was the norm (does anyone remember the roundheaded Leeds United of the era?). What has any of this got to do with me, an architect living and working far away from 1970s Holland? As it happens, 70s Dutch football is one of my foundation stones. I became fascinated by, and then obsessed with, those counter-cultural players who lit up our screens just as we were going from black and white to colour. They expressed something more than just football; they spoke to me of culture and imagination. Of all the Dutch players Ruud Krol, and not Cruyff, was my hero; a super-elegant, brutally hard defender who was a multilingual art lover off the field. If I could be a superhero for a day, this is still who I’d be. Of course this was about an adolescent looking for an identity, preferably something a long way from home, but it’s always stuck with me. Eventually I found my metier in the world of architecture, which allows me to create my own angles and spaces in the absence of any noticeable footballing ability. As a runty teenager, I used to dream (yes, actually dream) that when I came face to face with Ruud Krol, he would tower over me. While I was studying construction at the RTC in Letterkenny I went to bed early every night because somebody told me that ‘you only grow when you’re sleeping’ and, ridiculous as it sounds, I crept upwards very slowly. Still not tall enough though upon leaving the RTC to stop the dreams. From the late 1980s to the mid 1990s, Johan Cruyff managed Barcelona FC, and Barcelona became the spiritual inheritor of the Total Football way. They now play the best football in the world, and they are everybody’s second favourite team. They have a Catalan, anti- authoritarian streak and take pleasure in beating the more uptight Real Madrid, which was allegedly General Franco’s team of choice. The main difference between the Barcelona and Holland teams is that Barcelona now win the big games whereas Holland lost them, showing that Cruyff wasn’t really a happy loser. The most successful recent manager, Pep Guardiola, is a protégé of Cruyff and freely admits that, at his most successful, he was simply providing maintenance to the cathedral that Cruyff built. Back in 2001, I finished studying architecture in university, got married, and we had our first son. I also began working at what was then Allan Associates Architects, my first and only job as an architect. It was a time of beginnings. Along the way, I convinced my six-months pregnant wife that sitting in Dublin Airport for two days to wait for the Holland team to arrive for the World Cup Qualifier was a good idea. I knew that Ruud Krol would be on the flight, as he was assistant manager to the Dutch team at the time. When I did come face to face with him, we were exactly the same height. I’m sure there are people like me everywhere, for whom the bright orange glow spread well beyond football. Like ancient starlight, it lit the way long after the flame had burned out. Johan Cruyff and his family continued to live in Barcelona, and it was there that he died on Holy Thursday. His afterglow will be long.